RSS (Rich Site Summary) or most commonly known as Really Simple Syndication… is a means of letting you know when your favourite websites are updated. Every blog has a feed, even mine (see the top right of this page). With an RSS feed you can keep subscribed to content such as news, comics, or blog posts. So what do you do with these feeds now that you have them? You can actually view them all in one place! But you will need an RSS reader. Now there’s many options available, but I suggest you start with my preferred reader, Google Reader. It’s online, accessible anywhere, and is really simple to use. If you already have a Google account you can get started right away, if you don’t you’ll need to sign up, but let’s be honest here, most of you probably have one by now! To add a feed, copy and paste the link from your desired website. I do this by right clicking on the RSS icon (like the one shown above) and select “copy link address”. I then go into Google Reader, click “Add a subscription” and paste it into the box. Click Add. If you type in just the website address, Google can usually find the feed for you, but often sites have more than one RSS feed so it pays to select the right one. Now that you have the website in your reader, you can check up every now and then to read the latest haps. It’s part of my daily ritual, along with checking my email. Some websites only give you part RSS feeds, which means you have to click the link or post title to be taken to the site for the full article. By simply clicking on a post you have “read” it. 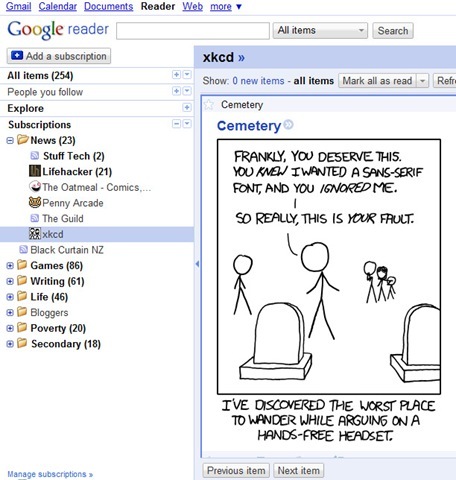 There’s a few other options in Google Reader, such as marking all as read if you want to tidy up in one fell swoop. If you get a lot of feeds you can then organise them into different folders. For instance I have several folders set up including a news folder, a games folder, and personal blogs folder. So go on and have some fun. Just don’t pile up on the feeds, you want to have the time to read them. To make life easier you can choose which posts to read and which to ignore. Not every post is relevant to your needs, and you’ve got a life to live remember. Start with adding my RSS feed! If you’re already into the olde RSS, do you have any favourite feeds you’d like to share?